Here is a recent report from Reuters, showing the difficulty in covering Egypt well. Kudos for going there, but we can only trust the journalist for his/her impressions. The pronoun is not specified, as he/she requested anonymity. The fear, likely, is of covering anti-regime sentiment. The question is if he/she covered it well. The brief story is that Kerdasa, Giza was the site of an Islamist take-over following the dispersal of the pro-Morsi sit-ins at Rabaa and Nahda. That day locals stormed the police station with rocket-propelled grenades, killing 12 officers. Authority was not reestablished until a month later. Since then, 185 Brotherhood supporters have been sentenced to death for their role in the violence. The headline states: Sisi’s Crackdown on Islamists Yet to Win Over Egyptian Village. Fair enough, as Kerdasa would be a difficult village to win over. The article reports that night raids on suspected Brotherhood members continue, and the police man checkpoints into and out of the village. A look around Kerdasa offers plenty of reminders that arrests and intimidation have never succeeded in silencing enemies of the state. Idle teenagers who can be easy recruits for jihadists. Women covered from head to toe in black. 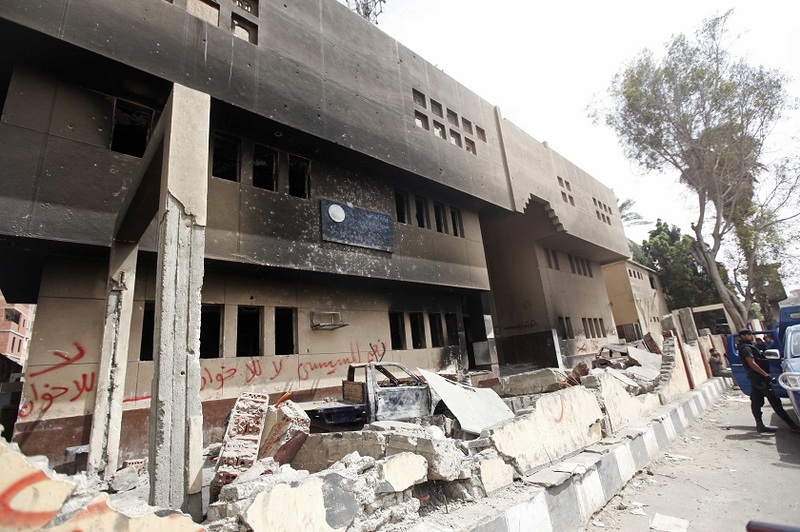 Profanities scribbled on a burned-out police station insulting President Abdel Fattah al-Sisi and calling for Mursi’s return. This is one of the troubles in reporting about Egypt — those reading don’t know the commonality of everyday life. Teenagers are idle in every city. Many women wear the full niqab. And anti-Sisi graffiti from the past year and a half has rarely been scrubbed from the walls. None of this necessarily suggests a dissatisfaction with him, nor ongoing support for Morsi. Ayman al-Qahawi works at Al Azhar, a center of Islamic learning seen by Sisi as an ally in the fight against extremism. “Kerdasa has become a black spot in our lives even though there are only a small number of criminals. They treat all of us as if we are terrorists,” said the professor, adding that a colleague was not allowed to leave Egypt because his identification card showed he lives in Kerdasa. Bus driver Sayed Hassan, 31, says that when he went to renew his vehicle license, police stopped him at a checkpoint. “Pull over you terrorist. You are from Kerdasa. You will spend a lot of time with us,” he quoted an officer as saying. What should be inferred from these voices? Is Kerdasa so Islamist they don’t fear to give their names, safe in the protection of village solidarity? Or that Kerdasa is in the process of being restored, and thus there is no fear to voice complaint? Probably no inference is best, but the willingness to go on the record is a positive development. Of course, the fear of the correspondent is still telling. “We are sure that Mursi is oppressed and his case is political,” said student Abdel Rahman Mohamed, 22. A pharmacist blamed both sides for the deterioration in Kerdasa and in his finances. Fear, apparently, is shared by many. It makes reporting difficult.